Lovely Professional University student Avinash Mishra recalled great motivating moments he shared twice with Mr Sundar Pichai-the new CEO of world's largest search engine ‘Google’. Forwarding greetings to Mr Pichai, Avinash says: “I am fortunate that I saw and talked to Mr Pichai being very close to him on two occasions of Google I/O conference in San Francisco (USA). Mr Pichai is very soft-spoken, impressive and one of the most respected people in the technology industry. His rise to the top post in Google automatically confirms his inner qualities of technology, innovation and managerial expertise. I want Indian youth should be motivated by Mr Pichai’s success and so I am recalling all those great inspiring moments. Mr Pichai is indeed a symbol of new rising India to inspire Indian youth to be up to PM Modi’s latest slogan “Start up India, Stand up India”. Illustrative, Google had selected LPU student Avinash Mishra to represent India for its annual Google sponsored global technology conference in USA. 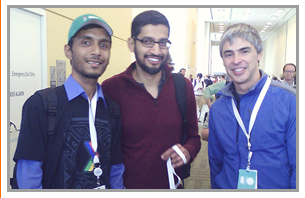 It was a rare chance for Avinash to participate in Google I/O conference and to be noticed by Google founder Larry Page and Mr Pichai. At that time Mishra was discussing on a latest Google oriented project amid different representative students of other nations.